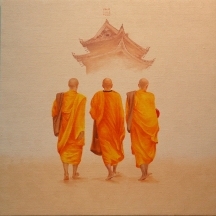 MINH PHUOC, (Vietnamese artist) paintings represent the concept of Moksa in a very evocative manner. 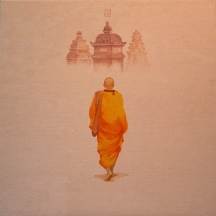 “Purposeful journey” “Search of fulfillment” strike a chord as you absorb the beauty of these paintings. Let me now relate it with the teachings on Vedanta by Swami Dayananda Saraswati on the purpose of Self Knowledge. If you notice the paintings once again and their order of sequence. 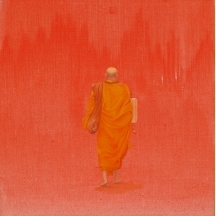 The first two paintings depict monks walking towards something that is not yet seen. This could be interpreted as the initial desire for liberation i.e. Moksa. 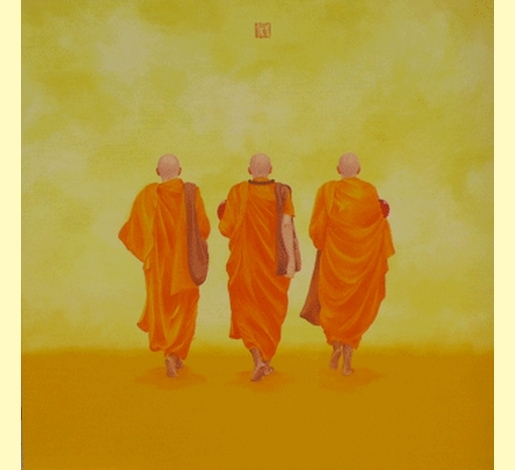 The second two paintings depict the monks walking towards a monastery a seat of learning or place where the guru who is an embodiment of knowledge resides; this could then be interpreted as a realisation that it is only knowledge that sets you truly free or a jijnasu. Across all the paintings you can see the purposefulness in their strides implying an intensity for liberation, which is mumuksutva. Moksa, Mumuksutva & Jijnasu understood through visual depictions & interpretations.